This tournament is a collaboration between Australian based Go Golfing, who have been hosting World Masters Golf events around the world for 24 years, and Thailand based Golfasian who look after more golfers travelling to Asia than any other golf tour operator. Hua Hin, Thailand, 25 October 2018 — For the second year running, Hua Hin in Thailand has won the International Association of Golf Tour Operators Award for Golf Destination of the Year in Asia. The award carries enormous weight as it is voted for by specialist golf tour operators who are IAGTO members. Located 200 km south of Bangkok, Hua Hin is the country’s oldest beach resort. 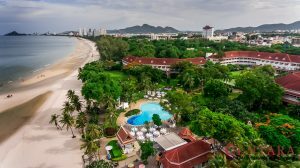 The summer retreat for Thailand’s Royal Family for the past 90 years, Hua Hin has long been a popular destination for Thai’s and an ever increasing throng of international tourists. Hua Hin was home to Thailand’s first golf course, Royal Hua Hin Golf Club, which opened for play in 1924. Nowadays Hua Hin boasts 7 quality courses, headlined by Black Mountain and Banyan golf resorts which are consistently awarded among the best for Asia not only for the golf course, but also for their caddies and the hospitality offered to golfers. Both the Asian PGA and LPGA tours host prestigious events in Hua Hin and not surprisingly Thailand based Golfasian in partnership with Australia’s Go Golfing are hosting big scale tournaments for every day club golfers in Hua Hin. In just 5 years, their Centara World Masters event, open to club golfers of all handicaps over the age of 35, has quickly gained a reputation for the biggest and most enjoyed amateur tournament in all of Asia. “In June each year, up to 650 golfers from all parts of the globe – 27 countries this year – converge on Hua Hin for this week-long celebration of golf, fun, camaraderie and entertainment. Reviewing the testimonials on the event website, it is clear golfers are pampered from go to whoa. Find me another event where you get a massage on arrival and organisers exchange your scorecard for an ice-cold Chang beer post round,” pointed out Pascal Orczech, Golfasian’s Director of Business Development. The Centara World Masters features great value packages for golfers and an impressive scheduled of activities to entertain non-playing partners. There are nightly social gatherings to foster friendship and camaraderie among the players, headlined by glamorous welcome and presentation dinners. The event features four rounds of competition golf on Hua Hin’s premier courses, inclusive of carts and caddies. Centrally located 5 star accommodation, transfers and much more is also included. https://edge.thailandworldmasters.com/wp-content/uploads/2018/10/Banyan-Hole-9-Club-house.jpg 1160 1900 7eF00OdDNm https://www.thailandworldmasters.com/wp-content/uploads/2013/04/cwmgc-logo.png 7eF00OdDNm2018-10-25 14:00:402018-10-24 15:45:59Hua Hin Wins Asia’s Best Golf Destination - Again! https://edge.thailandworldmasters.com/wp-content/uploads/2017/06/2017-CWMGC-030.jpg 270 700 7eF00OdDNm https://www.thailandworldmasters.com/wp-content/uploads/2013/04/cwmgc-logo.png 7eF00OdDNm2017-06-20 10:58:102017-06-20 11:29:442017 Centara World Masters – The Most Enjoyable Week of Golf! 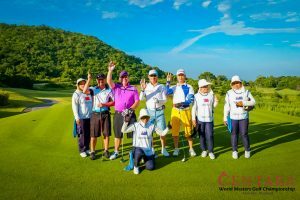 Golfers have been quick to rate the third annual Centara World Masters Golf Championship hosted in Hua Hin as the best ever. Playing in the tournament for the first time, Victor Danko from Australia declared it was the best week of his life. Victor Danko receiving his award. At 71 years of age, Victor is a member of Bayview Golf Club in Sydney and plays off a credible handicap of 10. He scored 136 points for the 4 rounds of stableford competition and finished in second place in the 66+ A grade division. “I have played lots of tournaments, but none better than this week. It will take some time for this smile to go away. I loved everything. The courses were so good, especially Banyan and Black Mountain. The caddies were spot on and the chatter between caddies and players was great fun. I have never felt better or more relaxed on a golf course and no doubt it helped my scores. The caddies found my ball even when I thought it was totally lost. I came here on my own but it was so friendly that I never felt like I was on my own. I played golf with amazing people from all over the world whom I will definitely keep in touch with. Every night we were entertained and the free drinks were a bonus. The Centara Grand Beach Resort & Villas Hua Hin is just so beautiful and the staff treat you like royalty. It is 5 minutes’ walk to the centre of town where you are spoilt for restaurants and bars. I had a massage most days for about $10 and everything is such great value. I don’t know exactly how many players were here this week, but I know it was more than 400 golfers from 23 countries and we were all so spoilt. Go Golfing and Golfasian know how to look after golfers. Little things like having the buses take you to and from the courses, your golf clubs valeted from course to course, everything clearly explained so you really didn’t have to think about much which is great when you’re on holidays. This has been the best week of my life and I will be back every year,” said Victor. Centara World Masters Participants and their caddies wearing customized caddie bibs. Hua Hin, about 2.5 hours south of Bangkok, was awarded Asia’s Best Golf Destination in 2014 and serves up a winning combination for tournament participants. Drought conditions in Thailand required organisers to change the host courses and reduce the field from 650 golfers to a capacity of just 430 this year. 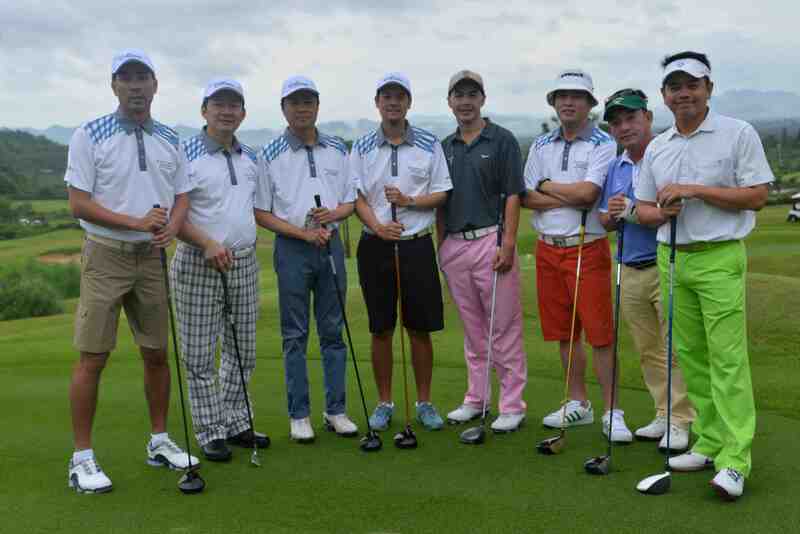 Golfers played 2 rounds at Black Mountain, Asia’s number one ranked course, Banyan Resort and Sea Pines. Carts and caddies are included at all courses. Each player has a caddy wearing a bib with their name and country flag. There’s more than US$30,000 in golf prizes and lucky prize draws won. Big winners were Eric Butler from Australia who won a return trip to the 2017 Centara Masters and Irene Goh from Malaysia who won at trip to the Ladbrokes World Masters on the Gold Coast in Australia. Irene was also the champion for the ladies 60+ A grade. There were 2 holes in one at the tournament, both by Australians. Richard Mittra from Beaconhills scored a hole in one on the 17th at Banyan, while Mark McDougall aced the 11th hole at Black Mountain. Sponsored by TaylorMade, Mark also received a bonus of a 30,000 Baht set of golf clubs. The Tournament is played in 15 divisions based on age and handicap. Golfers play each day with competitors of a similar age and handicap. Tournament champions came from Australia, New Zealand, United Arab Emirates, Malaysia, Philippines, China, Ireland, Thailand and the United States. Visit www.thailandworldmasters.com to view the official golf results. 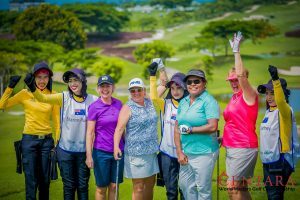 The Centara World Masters is co-hosted by Australian-based Go Golfing and Golfasian who look after more golfers in Thailand than any other tour operator. The seamless co-ordination of flights, accommodation, transfers and event logistics for 600 plus golfers is among the event’s notable achievements. In addition to Centara Hotels and Resorts, reputable companies including TaylorMade, Coca-Cola, Chang and the Tourism Authority of Thailand are proudly contributing to the ongoing success of the tournament. The event raised 109,500 Baht for Jungle Aid, a charity providing a better future for displaced Thai children in remote communities. 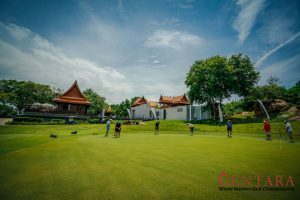 Hua Hin, Thailand, 29 June 2015 — The Centara World Masters Golf Championship has confirmed its status as Asia’s biggest and richest tournament for club golfers – and is now set to become even bigger next year. More than 700 visitors from 23 countries, representing 181 golf clubs, converged on Thailand’s resort town of Hua Hin for the second annual tournament, held from 14-19 June at four local courses. With 200 more participants than the inaugural tournament last year, the Centara World Masters has quickly demonstrated how appealing to amateur golfers is this professionally-organized and run event. A further 100 participants are expected next year, taking the field to maximum capacity. The tournament, for male and female golfers aged 35 and over, this year attracted participants from as far as Iceland, France, Germany, USA, and South Africa. More than half the entrants were from Australia, with big contingents from New Zealand and India. Asia was well represented with entrants from China, the Philippines, Vietnam and Singapore. 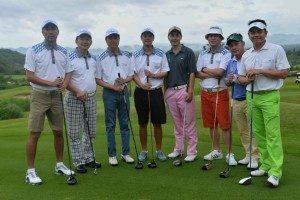 China golf travel specialists, Unitrip, brought 42 players from Grand Hill International Golf Club, Chengdu, the biggest number from any single club. “This is the largest ever amateur golf tournament Golfasian has hosted. Just two years ago I would not have imagined in my wildest dreams that we would be doing this. I am thrilled to be part of this and cannot wait to welcome even more golfers from around the world next year,” commented Mark Siegel, Tournament Director and Managing Director of Golfasian. Forty-three tournament staff ensured the tournament’s smooth operation and provided hospitality and service to competitors. Like many participants, the Philippines’ Pablo Soon was impressed with all aspects of the event. “With my friends we travel the world playing tournaments. This is the best service we have ever experienced. There was hospitality staff to look after everything,” he said. A total of 8847 bottles of water and 9123 bottles of beer were handed out during the competition. 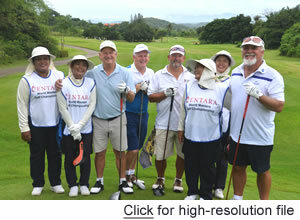 Eighty non-golfers were treated to cooking classes and a Hua Hin tour. Many also chose day trips to Hua Hin’s floating market and the River Kwai. “We are so delighted with the success of the event and based on the overwhelmingly positive feedback from participants, we are planning for 800 participants next year,” tournament director, Peter McCarthy, the principal of Australian tour operator, Go Golfing, announced. Registration for the 2016 tournament, from June 12-18, opens on July 1. Michael and Christine Marks of Sydney, Australia were among many to confirm their return in 2016. “We loved the courses and meeting new friends. We are already looking forward to next year,” Michael said. Rolf Mulder of Western Australia was among those who extended their travels in Thailand. 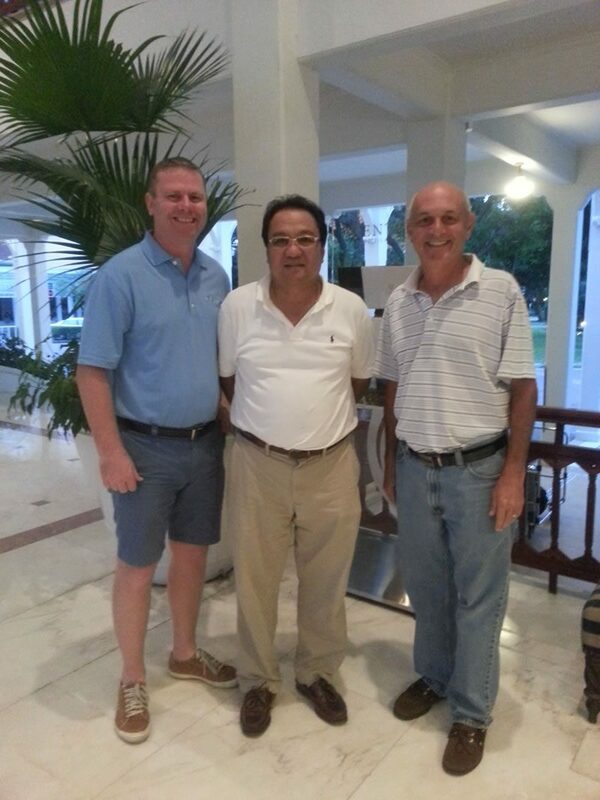 “We arrived a week before the tournament to enjoy more courses. They were all a very high standard. I have played golf in Asia before and these caddies were just fabulous,” he said. The tournament’s headline sponsor, Centara Hotels and Resorts, was backed by TaylorMade-adidas Golf, Thai Beverage, Coca-Cola Thailand, the Tourism Authority of Thailand, Black Mountain Golf Club, the City of Hua Hin and D’ablo Sportswear. A gala prize giving party at the Centara Grand Hotel on the final night saw the main lucky draw prize go to Kim Payne of Thailand who won a return package to the 2016 Centara World Masters, while the Philippines’ Lansen Hsieh won a trip to the Ladbrokes World Masters on Australia’s Gold Coast in October. Three players scored a hole in one during the tournament. Australia’s Rob Wilson aced the 6th hole at Majestic Creek, Thailand’s Nithis Jamlongkaew holed out on the 4th at Imperial Lake View and Alistair Purves (UK) recorded his hole in one on the par-4 17th at Black Mountain. Congratulations! Players from Australia and Asia dominated the 20 ladies and men’s divisions. June 11, 2015 Hua Hin, Thailand — Golfers from every continent except Antarctica have begun arriving in Thailand for the second running of the Centara World Masters Golf Championship, Asia’s biggest and richest tournament for club golfers. A record 700 visitors from 23 countries will have arrived in Hua Hin by Sunday for the start of the championship. The tournament has attracted big numbers from Australia, the Philippines, India, New Zealand and China is represented for the first time with 42 golfers from Grand Hill Golf Club in Chengdu. The event’s international appeal has attracted players from France, Germany, United States, the United Kingdom, UAE and even Iceland. ASEAN nations are well represented with 88 players, including 18 from host country Thailand and 15 from Vietnam. The Centara World Masters is open to golfers aged 35 and over, with competition across 14 divisions based on age and handicap. Golfers will compete for more than 1.5 million Thai baht in prizes. The tournament is a major boon for tourism in Hua Hin during low season. Host hotel, the Centara Grand Beach Resort and Villas Hua Hin, is fully booked with event participants as is Banyan, The Resort. Hilton Hua Hin Resort & Spa is also nearing capacity. More than a golf tournament, there are nightly social events. Starting poolside at Centara to welcome golfers and partners on Sunday and continuing at various venues throughout the week, the grand finale is a colorful presentation dinner on Friday evening. The Centara World Masters is a join partnership between Australian-based Go Golfing and Thailand’s Golfasian. Both companies are the leading golf tour operators in their respective regions. 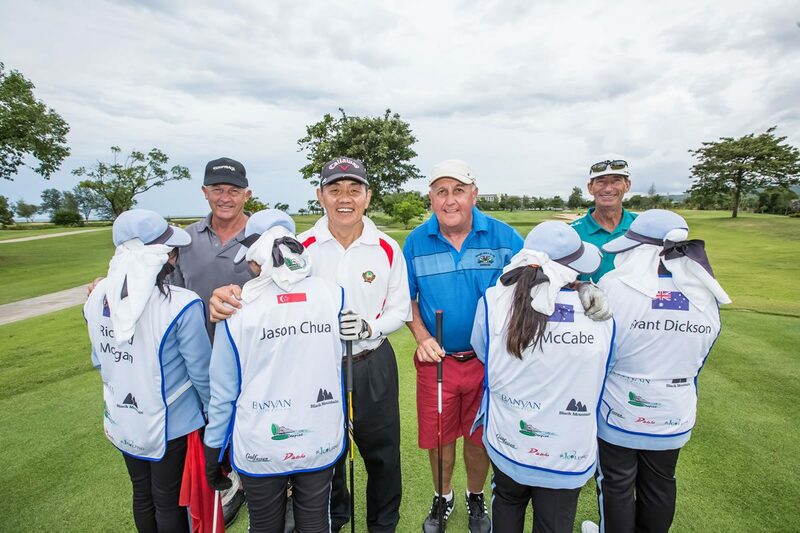 Hua Hin, Thailand , 29 October 2014 — Following the enormous success of the inaugural 2014 Centara World Masters Golf Championship, Thailand-based Golfasian and Australia’s Go Golfing are pleased to announce an expanded event to be held again in the city of Hua Hin, Thailand from 14-19 June 2015. The biggest event of its kind in Asia, the tournament quickly earned a reputation as Asia’s best week of amateur golf. 500 competitors from 23 countries were unanimous in their praise of the golf courses, caddies, event organization and social functions. Further enhancements have been made to the 2015 program to ensure it is even more enjoyable. “At Centara Hotels and Resorts we are very delighted about the immense success of the inaugural event and are excited to welcome even more golfers to Hua Hin in June 2015” said Khun Thirayuth Chirathivat, CEO of Centara Hotels & Resorts. The tournament is open to male and female golfers aged 35 and over. There are 15 divisions based on age and handicap. Playing with golfers similar in age and standard is one of the event’s great attractions. At the heart of its success is the camaraderie cultivated among participants. The 2015 Centara World Masters Golf Championship will again see participants play a selection of Hua Hin’s world class golf resorts with all the trappings of a major professional event; details include competitor bibs worn by their caddies, embossed with participant names and flag of origin just like the US Masters at Augusta National. Black Mountain, home to the recently announced co-sanctioned European/Asia Tour 2015 Thailand Classic, Banyan, Majestic Creek and Imperial Lakeview combine for the ultimate golf experience. There are social events each night at the beautiful Centara Grand Beach Resort featuring fabulous Thai and International cuisine plus world class entertainment headlining the gala prize presentation dinner. Despite its amateur status the event is Thailand’s richest with US$30,000 in prizes and lucky draws. See https://www.thailandworldmasters.com/ for further details and event updates. Centara Grand Beach Resort & Villas Hua Hin is one of the classic hotels of Asia. This sophisticated colonial style resort was originally opened in 1923 as the Railway Hotel. With its prime beachfront setting, extensive topiary gardens, myriads of facilities, and a gracious décor from Superior to Pool Villas for your own luxury and privacy. The resort is a member of The Leading Hotels of the World and is an iconic multi-award winning hotel in the centre of Thailand’s famed royal resort town. Hua Hin, Thailand, June 23 — The success of the inaugural Centara World Masters Golf Championship, a week-long tournament played last week in Hua Hin, Thailand, has prompted its organisers to plan an expanded event for 2015. The tournament, for male and female club golfers aged 35 and over, attracted more than 500 participants from 23 countries, representing 193 golf clubs. It was the largest event of its kind ever played in Asia. “We are so delighted with the success of the event, and based on the overwhelming positive feedback from participants, we are planning for 700-plus participants next year,” tournament director, Peter McCarthy, the principal of Australian tour operator, Go Golfing, said on Sunday. He and fellow organiser, Mark Siegel, who owns Asia’s largest golf tour operator, Golfasian, have already received more than 100 bookings before the launch of the 2015 event, to be played again in Hua Hin, from June 14-19, 2015. Black Mountain, Banyan, Majestic Creek and Imperial Lake View were the host courses this year, and with the anticipated increase in participants, more courses may need to be added. Ross and Barbara Hopkins, of Caloundra on the Sunshine Coast of Queensland, Australia, were typical of many participants who said the tournament exceeded all expectations. The headline sponsor, Centara Hotels and Resorts, was backed by TaylorMade-adidas Golf, Thai Beverage, Coca-Cola Thailand, the Tourism Authority of Thailand, the City of Hua Hin and D’ablo Sportswear. A gala prizegiving party at the Centara Grand Hotel on Friday night saw the main lucky draw prize go to Sujurd Tsao of Taiwan, who won a return trip to the TaylorMade World Masters on the Gold Coast, Queensland, Australia in October. Runner-up, Nat Anderson of Western Australia, won a trip to next year’s Centara World Masters. Players from South Africa, Australia, Ireland, Singapore, the Philippines and India won the 16 ladies and men’s divisions contested during the tournament. All scores are on the tournament website: www.ThailandWorldMasters.com which will also soon feature information about the 2015 event. Rounds played at Imperial Lake View, Majestic Creek, Banyan and Black Mountain golf clubs have produced tightly bunched leader boards in men’s and ladies divisions at the half-way stage of the tournament. South Africa’s Desiree Geldenhuys is the ladies 35-55 gross leader with 156 followed by Singapore’s Mee Nah Fong and Denise Seow, who is the stableford leader. In B grade, Philippines player Anli Wu is the leader. South Africa’s Henk Guldenhuys is the men’s 35-55 gross leader on 148, eight shots clear of Bangladesh player, Arshi Haider, Theo Wessels (South Africa) and Buddy Bagi (Australia). The stableford leader is another South African, Craig Shillaw. Singaporean Johnny Ang leads B grade and Ireland’s Gerry Raftery is the C grade leader. The men’s 56-65 division is led by Australia’s Bill Maystorovich, with fellow Aussies Richard Heaney abd Peter McCowan the B and C grade leaders. Peter Cherry of ustralia is the men’s 66-plus gross leader by 20 shots. He also leads the stableford division, while Ireland’s Michael Barry and Australia’s Gordon Thomas share the B grade lead. Two heavy downpours of rain cleared the courses yesterday, but afternoon players were able to resume and complete their rounds after breaks of 30 to 45 minutes. Conditions have been perfect for golf, with overcast skies and a breeze keeping temperatures in the low 30s. The opening day of the Centara World Masters was played on Monday in mild, overcast conditions at Banyan and Imperial Lake View golf clubs in the Hua Hin area of Thailand. Several excellent scores were recorded, with winners in ladies divisions from Singapore, the Philippines and Australia. Men’s division winners came from South Africa, Ireland, Australia, India and Vietnam. The Centara World Masters is the largest amateur tournament every played in Asia. Being held over four days at four courses in the Hua Hin area, it has attracted players from 23 countries who are staying in several hotels in the Hua Hin area, including the historic Centara Grand in Hua Hin. The Tourism Authority of Thailand is especially pleased with the success of the tournament, which is being held at a time when the Kingdom is experiencing a downturn in tourism. Hua Hin, named last week as 2014 golf destination of the year for Asia and Australasia, is to host its own version of the world’s largest and most successful amateur tournament for club golfers aged 35 and over. The Centara World Masters Golf Championship, to be held at four courses near Hua Hin from June 15 to 21, 2014 is expected to attract more than 600 golfers from around the world. The tournament, which will be played in 15 age and handicap divisions, will adopt the same format as the Mitsubishi World Masters, an amateur event that has been held on the Gold Coast in Australia for the past 18 years. 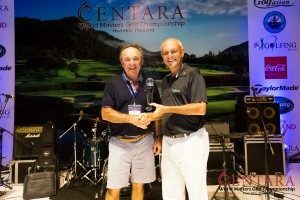 Peter McCarthy, the principal of Go Golfing, who has conducted the tournament in Australia since its inception, has teamed up with Golfasian, the Bangkok-based inbound golf tour operator, and Centara Hotels and Resorts to create the event. The tournament will put major focus on Hua Hin as a golf tourism destination after being named last week as Golf Destination of the Year (Asia and Australasia) at the International Association of Golf Tourism Operators annual convention, held in Spain. Pattaya won the same award in 2012. Hua Hin and Pattaya are the only two regions, other than countries, to receive the accolade. Hua Hin has seven golf courses, including two of the best in Thailand – Black Mountain and Banyan that were opened in 2008 and 2009 respectively. In the past five years Hua Hin has become one of Asia’s most popular golf tourism destinations. Royal Hua Hin Golf Club established in 1924, was the first golf course in Thailand. The Centara World Masters, to be held at four leading courses, is open to golfers aged 35 and over. The four-round stableford tournament will be played in 15 age and handicap divisions that ensure golfers of a similar age and standard play together. Prizes valued at more than $30,000 will be given away at the final night gala dinner. The tournament is open to all amateur golfers aged over 35 with an official handicap. “The Mitsubishi World Masters has been such a huge success in Australia, attracting players from all around the world, that we wanted to take the format to Asia,” Peter McCarthy said this week. “Hua Hin is a perfect golf destination, with great courses, beaches and other attractions. “Black Mountain has been named best course in Thailand for each of the past three years and is an awesome golf experience. Banyan was named best new course in Asia in 2009, has been in the top three in Thailand for several years and its clubhouse was voted best in Asia for 2013 and again, just two weeks ago, for 2014. “The other two courses where the tournament will be played, Majestic Creek and Imperial Lake View, are beautifully presented and highly enjoyable layouts that will please all participants. Accommodation will be at the Centara Grand Beach Resort and Banyan Resort, Hua Hin. Packages are now available, with a $100 discount for bookings made by December 31. Pre and post golf tours in Thailand can also be booked. The major sponsor, Centara Hotels and Resorts, has 20 properties in major tourism centres of Thailand, including Bangkok, Hua Hin, Pattaya, Phuket, Krabi and Chiangmai. Other sponsors include Thai Beverage Public Company Limited, the brewer of Chang beer, Coca-Cola (Thailand) Limited, Thai Airways and Golfasian. The principal of Golfasian, Mark Siegel, said Thailand had emerged in the past decade as one of the world’s top three golf destinations and is now welcoming 750,000 foreign players a year. “You don’t just get great golf in Thailand, you get a memorable holiday experience,” he said. “The record speaks for itself – foreign golfers come back again and again. Photo: Black Mountain Golf Club, one of four courses that will host the Centara World Masters in June 2014. Bangkok, December 16, 2013 — TaylorMade-Adidas Golf has become the fifth major sponsor of Asia’s largest amateur event for club golfers, to be held in Hua Hin, Thailand next June. The Centara World Masters Golf Championship – from 15 to 21 June, 2014 – is expected to attract 600 amateur golfers from around the world who will come to the region named in November as Golf Destination of the Year for Asia and Australasia. Title sponsor Centara Hotels and Resorts has been joined by Thai Beverage, Thai Airways, Coca-Cola (Thailand) and now TaylorMade-Adidas Golf in supporting the event. Prizes valued at more than $US70,000 will be on offer for participants who will play in 15 different age and handicap divisions. The event is open to all club golfers (men and women) over 35 years of age with a verified handicap. It is based on the highly successful Mitsubishi Masters tournament that has been held on the Gold Coast, Australia, for the past 18 years. Organiser, Peter McCarthy, the principal of Go Golfing in Australia, says the entry of TaylorMade-Adidas Golf as a major sponsor is a great endorsement for the tournament. “TaylorMade and Adidas are brands synonymous with excellence in sporting equipment and apparel and so we are delighted to welcome the company as a sponsor,” he said. “We now have leading brands in their respective fields involved in the event – Centara Hotels and Resorts, the leading hotel brand in Thailand; Thai Beverage, the brewer of Chang beer; Thai Airways, the kingdom’s respected national carrier; and Coca-Cola, the world’s leading soft drink producer. The event will be played at four courses in Hua Hin – Black Mountain, Banyan, Majestic Creek and Imperial Lake View. In November, Hua Hin was named Golf Destination of the Year for Asia and Australasia at the International Association of Golf Tourism Operators’ convention, held in Spain. Black Mountain has been named best golf course in Thailand for each of the past three years at the Asia Pacific Golf Summit, as well as best championship course in Asia in 2011. It is the only course in Thailand to have been included (in 2012) in the US Golf Digest list of the Best 100 Courses Outside the United States. In January, 2014 it will host an Asian Tour event, the King’s Cup, which is being held for the fourth time after being introduced to the tour schedule in 2009. Meanwhile, Banyan’s clubhouse has been voted best in Thailand for the past two years and was named best new course in Asia Pacific in 2010. Accommodation for the Centara World Masters will be at the Centara Grand Beach Resort and Banyan Resort, Hua Hin. Centara Hotels and Resorts has 20 properties in major tourism centres of Thailand including Bangkok, Hua Hin, Pattaya, Phuket, Krabi and Chiangmai. Lively social and entertainment events are scheduled for each night of the tournament, headlined by international acts at the welcome and farewell celebrations. Thailand’s biggest 19th hole will be staged each night at stunning rooftop, beach, and poolside settings. Packages are now available, with a $100 discount for bookings made by December 31. Pre and post golf and sightseeing tours in Thailand can also be booked. The Centara World Masters is being organised in collaboration with Asia’s leading dedicated inbound golf tourism operator, Golfasian. Costa Daurauda, Spain, 15 November 2013 — Hua Hin, the laid-back seaside town on the Gulf of Thailand that has been The Thai Royal Family’s holiday headquarters for more than 80 years, now has another claim to fame: Asia and Australasia’s 2014 Golf Destination of the Year. Hua Hin, 200 kilometres south of Bangkok, received the award this week at the International Association of Golf Tourism Operators’ annual convention (IGTM), held in Catalonia, Spain. It is only the second time a region, rather than a country, has been named Golf Destination of the Year in Asia/Australasia. Thailand has twice won the award and in 2012 the Thai city of Pattaya was the winner. The 2014 award was accepted by Hua Hin’s Lord Mayor, Khun Nopporn Vuttikul, at a ceremony at the end of the convention, which was attended by golf tour operators, and executives representing resorts, golf clubs and destinations from around the world. The accolade recognises Hua Hin’s rapid recent ascendancy to the pinnacle as a golf tourism destination in Asia Pacific. The site of the first golf course in Thailand, Royal Hua Hin Golf Club built in 1924, the region’s golf credentials have risen since the opening in 2007 and 2008 of Black Mountain Golf Club and Banyan Golf Club. Both courses have since been rated consistently among Thailand’s elite layouts. Black Mountain has been named for each of the past three years at the Asia Pacific Golf Summit, including again last week in Jakarta, as the top course in Thailand. In 2011, Black Mountain was named best championship course in Asia Pacific and the following year became the first course in Thailand to be included in US Golf Digest’s Top 100 Courses Outside the US. This year it was runner-up as best championship layout in the region. Banyan has been in the top three in Thailand for the same period and for the past two years its clubhouse was voted best in the region. Hua Hin, which literally translates as “head rock”, now boasts 11 golf courses, has become a popular destination for golfers from all over the world, especially during the peak winter season when its population of 85,000 swells two or three times. Its perfect year-round climate, laid-back village atmosphere, absence of a rainy season, wonderful beaches, restaurants and proximity to Bangkok are key reasons for its popularity. The general manager of Banyan Golf Club, Stacey Walton, says Hua Hin has become internationally recognised as a “friendly and charming resort destination with several kilometers of coastline, 5-star hotels, water theme parks, nice restaurants, spas, shopping and cultural attractions”. Footnote: A new city plan for Hua Hin, expected to be adopted in 2014, will ensure further development of the region. A high-speed train service is scheduled to commence from Bangkok in 2017.